After doing some brainstorming for my costume I decided that I wanted to go with a classic Halloween monster and be Frankenstein. 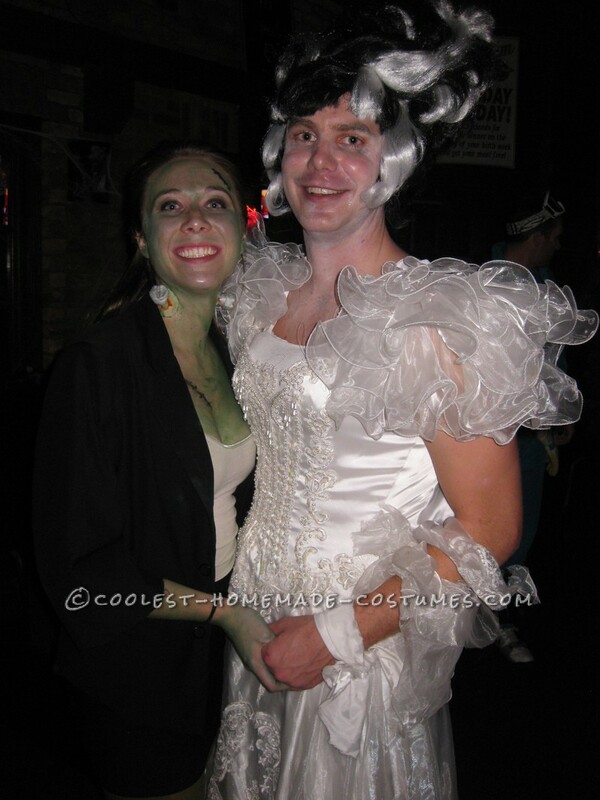 Unbeknownst to me my boyfriend had wanted to do a costume as a couple. When I told him what I wanted to be, he simply said “I guess that means I am going to be the Bride of Frankenstein”. For the Frankenstein costume I went to a Salvation Army and bought an old blazer and cut off several inches on the bottom, and on the sleeves. I just got a black skirt and some green tights for the rest and used green face paint on the exposed parts of my body. The bolts in the neck were found at a costume shop. For my boyfriend’s bride costume we also went to a Salvation Army and he tried on the old dresses until he found one he liked. The wig was from a costume shop also. Then just threw on some white face paint, black eye make-up and lipstick. Everyone loved the costumes and how we switched up the traditional couple’s roles. My boyfriend in his wedding gown certainly stole the show!